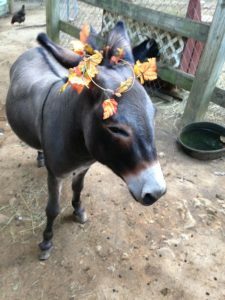 Fall is in the Air…..and on my head!! Hi Ho! Jose’ here! Kris seems extremely happy these days, I think it must be the leaves appearing off the bluff. She even came over and put some on my head for a photo! I think she’s crazy!!! I for one just like the cooler temperatures. Although, I do like the way the leaves taste once they start falling. There does not seem to be many acorns around yet, Charlie says that is because the trees are happy and don’t feel the need to reproduce (whatever that means). At any rate, if you like the pretty leaves like Kris does I think the time to enjoy them must be just around the corner. ← Why does the rooster crow?